Enable the “Continue Without Link” option. Note: These settings will be applied by default to any new flight you create. Accessible from the Site Scan Home page, in the upper right corner. Only available when connected to the drone. ISO is the level of sensitivity of your camera to available light. The brighter the lighting conditions, the lower you can set the ISO. Ideally, you would like the lowest ISO possible given the conditions, this reduces grain in the photos. However, selecting an ISO too low for the conditions will lead to blurry images and poor results. 100 ISO = Very bright day, no clouds, mid-day. 200 ISO = Bright day, morning, later in the afternoon. 800 ISO = low light conditions, early morning, evening. Note: This setting will be applied to all future jobs, including “Refly Mission”. Erases the camera’s Micro SD card. We suggest formatting the camera regularly. Note that the Sony R10C’s memory card should never be removed from the camera. Changing “Flight Settings” and “Advanced Settings” only affect that specific Job. These changes are saved in case you use “Refly Mission”. Select Flight Altitude which directly controls output resolution (Ground Sampling Distance or GSD), and flight time needed to map a given area. Increasing altitude is a great way to reduce flight time and the amount of photos of the mission. Bare in mind that for most applications, even at a 400 ft altitude resolution is more than sufficient. Controls the angle at which the camera will be pointed during flight. Typically only changed during “Cross Hatch Survey”. Can also be adjusted for “Area Survey” in specific cases. For “Cross Hatch Surveys”, a setting between 35º and 40º delivers best results in most cases. The horizon should not be visible in the photos or processing results may be poor. Avoid setting an angle greater than 45º. Controls the frequency at which photos are taken during a straight path. 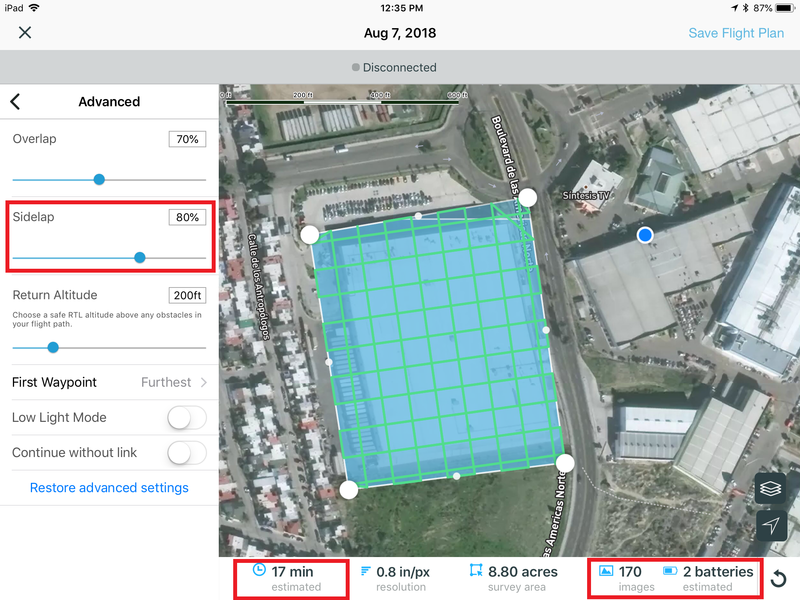 If the overlap is too high, the vehicle will lower the speed of the mission and will increase the number of photos, flight time and the batteries needed. Controls the distance between the flight path strips. The higher the sidelap, the closes the strips will be against each other, this it will increase the number of photos, flight time and the batteries needed. Crossflight Surveys is the only mode in which you should really consider modifying Overlap and Sidelap. Take into account the altitude of the flight and the camera angle. 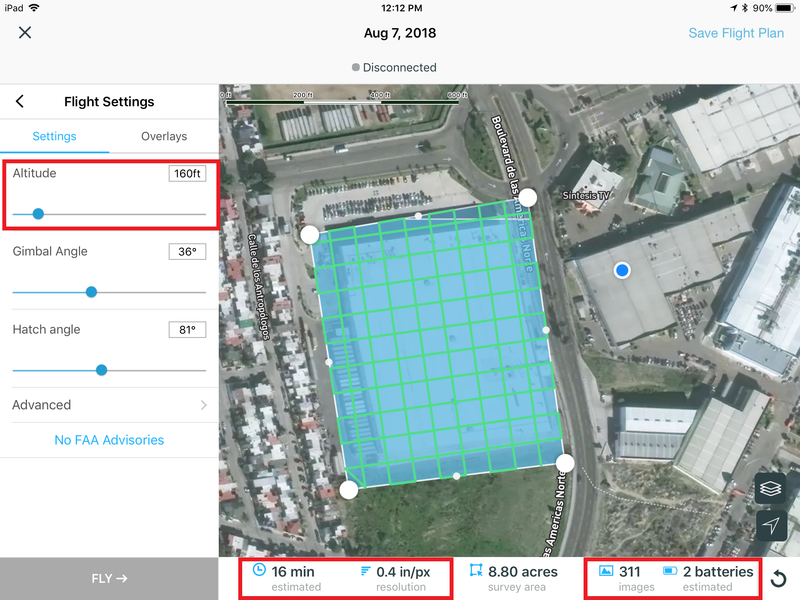 When the drone Returns Home because of low battery, lost link, or when commanded by the pilot on the Field App or on the controller, the drone will climb 33 ft (10 m) above its current altitude prior to flying back to the takeoff point. Using “Return Altitude”, you can increase the altitude at which the drone will return during the events mentioned above. The drone will not descend if it is already above the Return Altitude.– Note that this setting does not apply after a standard mission completion. In this case, the drone returns at the jobs “Flight Altitude”. In “Perimeter Scan” only, a similar setting is called “Safe Travel Altitude”. It applies to both the outbound leg after takeoff and the inbound leg before landing. Note that with “Safe Travel Altitude”, the drone will descend to the set altitude prior to returning to the takeoff point. This option is disabled by default. If your controller loses connection to the drone for any reason, the drone will abort the mission and return home immediately. 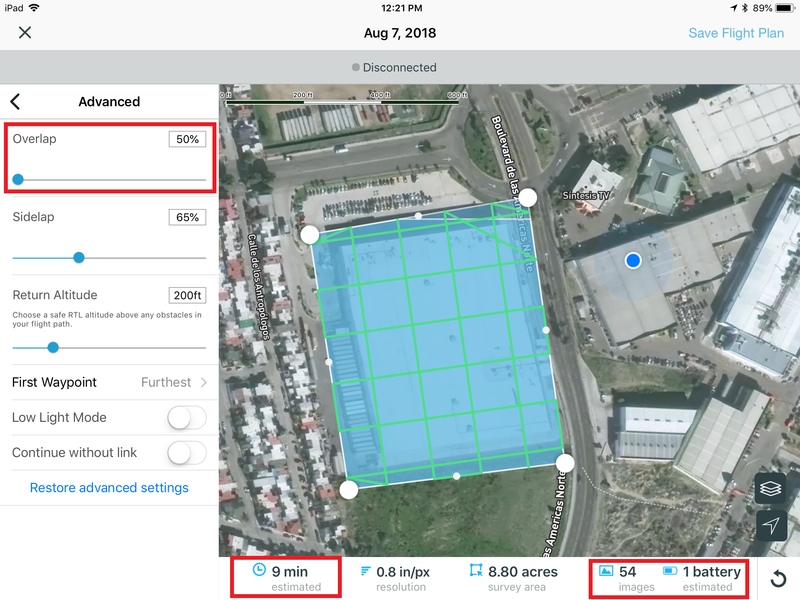 When “Continue without link” is enabled, the drone will continue flying autonomously even if it loses connection to the controller, complete its mission and return home. Note that all other safety systems are still active (i.e. “Low battery Return Home”). Restore Advanced Settings will reset the settings to the ones set in “General Settings”.